Singing is part of everyday life for most people; from jamming in the car to singing in the shower. Almost everyone finds themselves singing from time to time. Yet, most people sing off-beat and out of tune because of lack of proper training on how to sing. So, can anyone learn to sing? But with proper vocal chords exercises and training, you can master the art of singing. We have compiled several tips and techniques you need to master to sing well. Less than 5% of the population is tone deaf. This means that most people are able to distinguish between various musical notes and thus it is not their ears that have a problem, but their throat. Like your arms and legs, if you want to control your vocal chords, you have to strengthen your muscles. This way, you will begin to notice massive improvements in your singing. Learning how to strengthen your vocal chord muscles is like mastering any other life skill; you have to invest time and effort. There are simple singing exercises you can follow to achieve this. Often, we get told that we have a bad voice or we cannot sing. These words can stick to your mind and feed it with the notion that you cannot sing well. Yet, if you want to learn how to sing, you have to overcome the psychological implications of those words. Investing time in mindset training and meditation can be very beneficial. I like the Headspace app for meditation. Most people can learn by hearing how they sound and sing from an instructor who mimics their tones. This helps you learn the tones and chords that you are pronouncing differently. This technique has enabled many people to improve their singing ability. It can help you too regardless of your skill level. For most people, singing is not an easy thing, and you cannot learn how within a couple of days. It takes time as you have to do several vocal exercises five times a week for several months. Once you master the basic vocals, you keep on advancing. Learning how to sing is an endless process. Even the best singers continue to train and learn how to sing. Some people find it hard to sing consistently because they don’t know their vocal range. They are not aware of the notes they can and cannot hit. Your vocal chords determine the notes you can hit. Thus it is important for people to know their range and stick to notes that are within the range. This will help you reach the right notes. When you ignore nature; you will find it hard to sing. By nature, we mean your type of voice. Knowing your type of voice will help you learn how to sing. For instance, if you have a soprano voice, don’t try to force a base voice. It won’t work, and you will end up with terrible singing. You cannot sing in a flat voice; there will always be high and low tones. If you want to master the art of singing, you have to learn how to make adjustments to your voice. 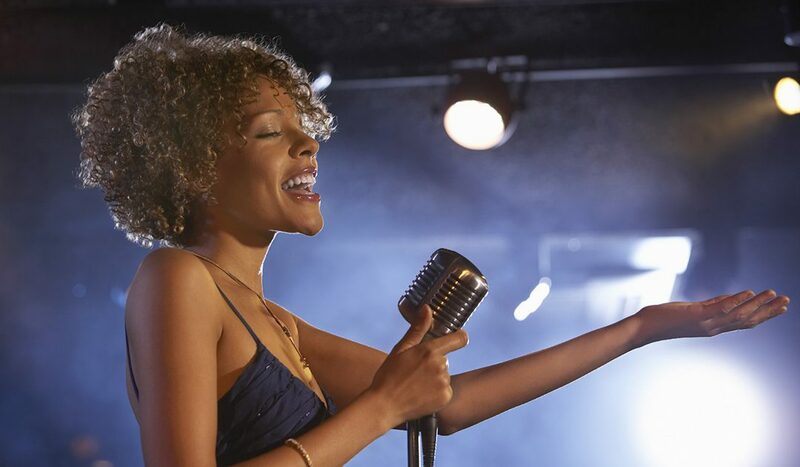 By doing vocal exercises, you will be able to hit the notes as required. Learning to sing requires simple things such as positioning your tongue, breathing, and opening your mouth. You also have to master vocal chords control. It becomes hard to learn and master all these things on your own. That is why you need to have a singing partner or an instructor to guide you on such things. Doing this will mean that anyone can learn how to sing on pitch. Like most skills, learning to sing is challenging in the beginning. Yet, with consistency and muscle training, you will find it easier to sing various genres. You will be able to sing using different notes within your range. Everyone starts from somewhere, and you have to climb the ladder before you become a pro. Can anyone learn to sing? Well, I think almost everyone can become a good singer. All you need to do is to be consistent and invest your effort in proper training. Your determination and patience will pay off. With time, you will find yourself singing confidently. It will always get better with time. You will be proud of yourself on that day when you get an appreciation for your singing skills. How about learning how in only two minutes?! ?